Pure white roses symbolize eternal love, peace and innocence, and we are sure Coco Chanel would agree that a gift box of long stem white roses is the pure essence of elegance. 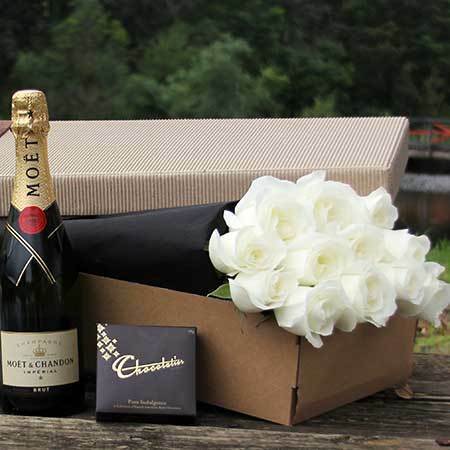 We have taken this romantic statement one step further and combined these divine white roses with a bottle of sparkling wine and a sweet little box of chocolate to add an extra special surprise. This gift makes is perfect for anniversaries, simple declarations of love, wedding proposals or the `day before the wedding` gift from the groom. Order your flowers via our online florist shop or give the team a call toll free on 1800 66 66 46. *Please note: The pictured product and presentation is exclusive to Sydney flower delivery only. 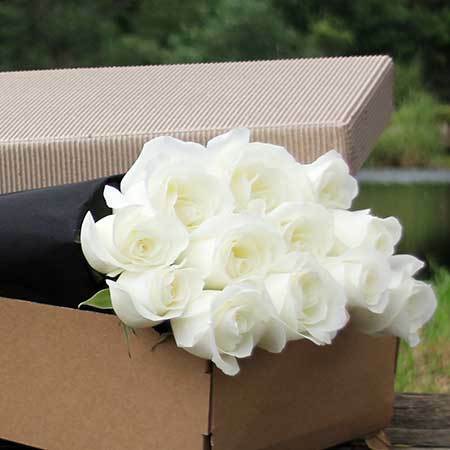 For flowers delivered throughout the rest of Australia, the team will coordinate your order via an affiliate florist network to recreate our style and product as closely as possible.